To share the love, copy the code from one of the button boxes below and paste it into an HTML widget in your sidebar. Or right-click on the image and download it to your computer, then upload it to your blog. 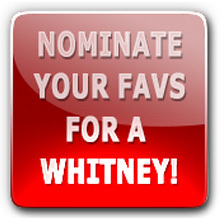 Click here to get a “Nominate a Whitney” Button for your blog or website. Two sizes, six colors!